NOTE: *Non-members need to leave a $50 key deposit, and pick up a key when arranging payment for court hire costs. Members: Lights $10.00 per hour plus key deposit of $10.00 plus a contact phone number. Non Members: $15.00 per hour plus key deposit of $10.00 plus a contact phone number. Non Members: Lights hire $10.00 per hour plus key deposit of $10.00 plus a contact phone number. Non Members: Accompanied by member $10.00 per hour. Any key that goes out must have a deposit and contact telephone number. Any key that is not returned within 24 hours does not get deposit refunded. 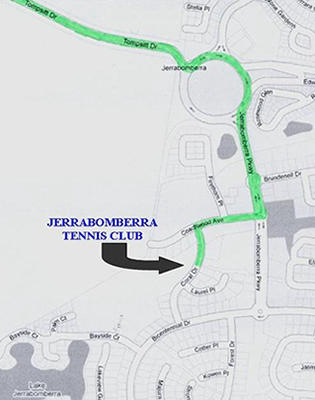 Jerrabomberra Tennis Club (JTC) commenced in 1997 with the handover of two tennis courts from the Queanbeyan City Council. Funding for the clubhouse was donated by Jerrabomberra Rotary. 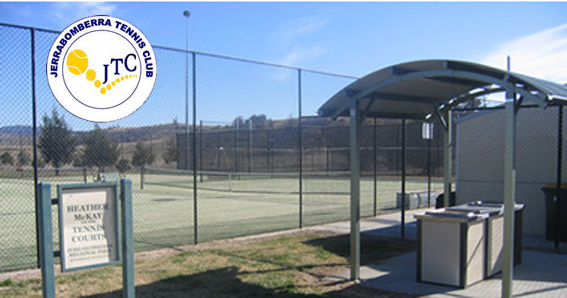 The facilities were upgraded a few years later with two more courts, additions to the club house and hit up wall which were officially opened on Sunday, 26 November 2000 by Queanbeyan Mayor Frank Pangallo MBE. The courts are named after Queanbeyan's international export and champion squash player, Heather McKay AM MBE. Heather now plays competitive tennis on the seniors' tour and we are proud and honoured to have her name associated with our club. JTC is affiliated with Tennis ACT and many of its members are actively involved in tennis competition at all levels. We have several teams, males and females, adult and juniors playing in local pennant competition. Our seniors have also been representing our club in recent years at annual Masters Games around the country. We also have a very active social membership that plays all year round every Wednesday night (7pm-10.30pm) and Sunday morning (8am-11am) including other regular social events away from the tennis courts. Come along and join us for fun on and off the court. Our professional TCA-ACT registered coaching staff offers a range of services from beginners learning to play, junior development, group and private sessions through to the serious competition players. To provide a relaxed and friendly environment to the residents of Jerrabomberra and the surrounding Canberra region to enjoy the game of tennis for all ages and all levels of play at a quality sporting facility. To provide support for all those interested in learning and improving their game with particular focus on junior development through commitment and dedication from committee members and excellent coaching staff.